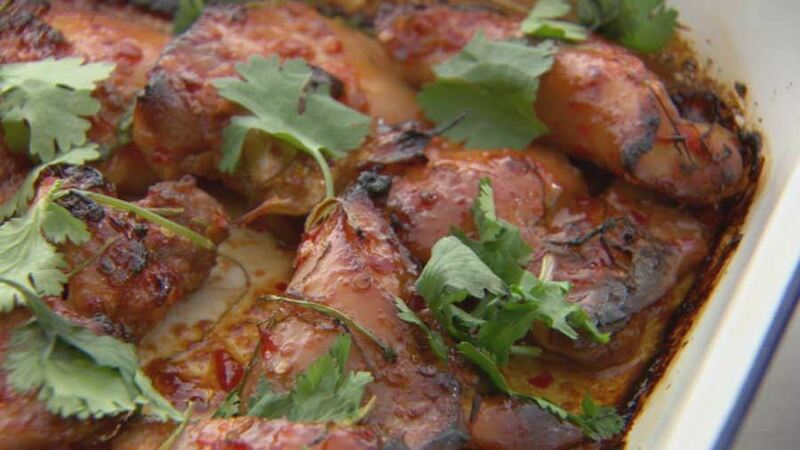 Combine chicken, sweet chilli sauce, garlic, ginger, coriander stems, sesame oil and salt in a ziplock bag. Seal bag and gently massage the flavours into the chicken. Set aside, to infuse, in the fridge for minimum of 2 hours or overnight. Put chicken and all marinade ingredients into a large baking dish. Place in the oven to roast until the chicken is cooked through, sticky and caramelised, about 25-35 minutes. Remove from oven. Scatter with coriander leaves and kaffir lime leaves.